I throw them into my autumn and winter soups! Cut the pumpkin, rutabaga, onion and sweet potato into chunks (I cut the pumpkin into quarters and steamed them in the microwave first). Heat the coconut oil in your pan to medium high temperature (I use a heavy slow cooking pot), add the chunks to the oil and braise them until the vegetables start to turn very lightly brown, stirring occasionally. As the apples are much softer, you can peal and cut them while the other ingredients are already in the pan. Add the apple pieces, the ginger powder and the turmeric as well as the stock and some water until all vegetables are covered. Season with some freshly ground pepper and some salt. Turn down the heat, put the lid on the pan and let the soup simmer for 30 to 40 minutes. Check the rutabaga and pumpkin if they are soft enough for pureeing. Take the pot of the heat, puree the soup and add the cream of your choice. I like my soups quite thick, you can always add more water or stock if you like it thinner. Top with almond flakes (if you have the time, you could fry these without fat before adding them, be careful not to let them burn). 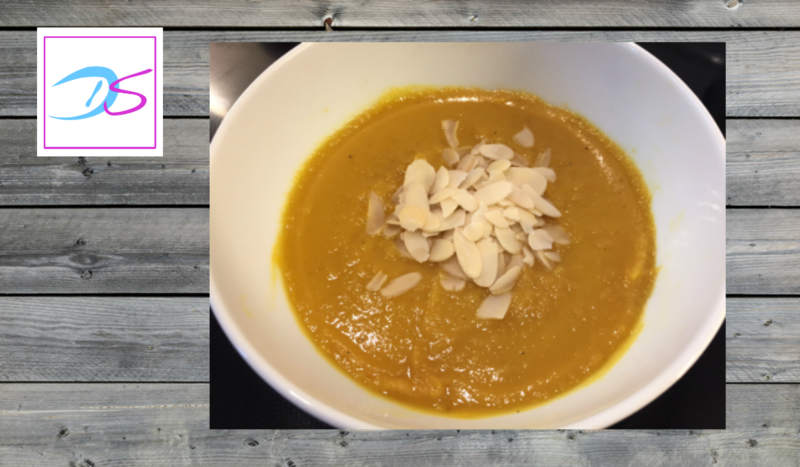 The ingredients of this soup provide you with a host of vitamins and minerals (vitamins A, C, E, B6, folate, calcium, magnesium, potassium, manganese and more) as well as dietary fiber. By adding almonds and/or bacon you are also adding some protein. You could also add some fried bacon pieces or replace the almonds with bacon pieces. If you are a fan of coriander leaves, I’m pretty sure they’d also make a nice addition and they also have detoxing properties.